The 32nd Annual Yosemite Renaissance is now on display at Gallery 5 in Oakhurst! The exhibit will be on display from Oct 14 through Nov 26, 2017, with a special Gala Reception on Saturday, Oct 21 from 4 to 8 pm, featuring live music with Good Medicine and a fire dance performance by Circus Etcetera! The annual Yosemite Renaissace exhibit opens in February at the historic Yosemite National Park Museum Gallery in the heart of Yosemite Valley, then travels to other art centers across California. 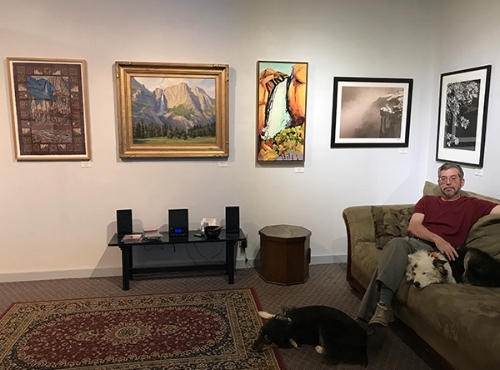 This year the show has traveled from the Yosemite Museum to the Kings Art Center in Hanford, the Carnegie Arts Center in Turlock, and now… settling down like a wild dove… at Gallery 5 in Oakhurst, completing the 2017 traveling exhibit as part of the Visit Yosemite Madera County’s ARTober celebration! Gallery 5 is located at Yosemite Gateway Gallery Row, 40982 Hwy 41, Oakhurst CA. Yosemite Renaissance is dedicated to supporting the arts in Yosemite and the Yosemite Gateway communities. The exhibit is sponsored by Mariposa County, Ansel Adams Gallery, Visit Yosemite Madera County, the National Park Service, and many other dedicated supporters and friends!